Nearly 300 leather fragments from an ancient Egyptian chariot, believed to date back to the New Kingdom, have been recently uncovered from the depths of the Egyptian Museum by a team of renowned archaeologists. Studying the technology and resources utilized in the building of such chariots, the team aims to reconstruct an ancient Egyptian royal chariot in 2014, using the same technology as that used by the ancient Egyptians. In constructing an exact replica of the chariot, Ikram and the team aim to gain an understanding of the construction technology and the leather used in its fabrication, as well as to test hypotheses about the uses of the different pieces of leather, which may prove to be a challenging endeavor. “Some leather pieces are folded over in a crumpled state, and the reconstruction of certain portions while trying to maintain accuracy in reproducing the technologies used might be more difficult than we anticipate,” said Ikram. Back in 2008, Ikram commenced work with Andre Veldmeijer, head of the Egyptology section at the Netherlands Flemish Institute in Cairo, on the Ancient Egypt Leatherwork Project, when they came across a 1950s publication by Robert Jacobus Forbes titled Studies in Ancient Technology. The manuscript spoke of a black and white photograph of ancient trappings and horse harnesses, evidently intact and said to exist at the Egyptian Museum in Cairo. Intrigued by Forbes’s findings, Ikram and Veldmeijer sought the help of museum curators to locate a cache of leather trays pertaining to an Egyptian chariot, including parts of the bow-case. By closely examining the findings, Ikram hopes to be able to better situate them within the backdrop of Egyptian chariotry. The Egyptian Museum Chariot Project findings fit in with a larger multidisciplinary and holistic research venture on leatherwork in ancient Egypt, which also includes the study of other fragmentary chariot pieces, such as those originating from the tombs of Thutmose IV (Carter and Newberry, 1904), Amenhotep II (Daressy, 1902) and Amenhotep III (Littauer and Crouwel, 1985, 1968 and 1987), as well as the leather finds from the Amarna period (Veldmeijer, 2010). This larger project is directed by Veldmeijer and Ikram. Aside from peaceable pursuits, the chariot was closely linked to the military, providing a moving platform from which the archer could shoot at the enemy. Hunting is also repeatedly depicted as a favorite sport of Egyptian royalty and nobility, and both are frequently represented pursuing desert games while riding in their chariots. Chariot processional scenes are believed to be popular from the 18th Dynasty onward, where the triumphant pharaoh is often shown to be returning alone from the battlefield. Recent radiological findings by an international team of experts may potentially dispel the long held-belief that cancer is a man-made, modern-day disease. With the diagnosis of the first real case of prostate cancer in a mummy, researchers say the causes of cancer may be more genetic than was originally thought. 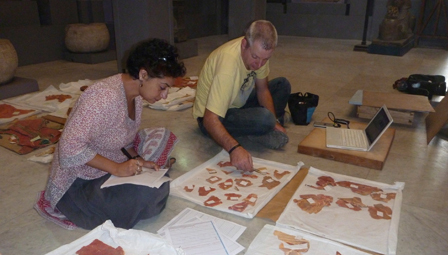 The study, published in the International Journal of Paleopathology and conducted in Lisbon’s National Archaeology Museum, initially examined three mummies through the use of X-rays and advanced computerized tomography scans. Those of M1, a male Ptolemaic Egyptian mummy, were particularly of interest as they revealed several dense bone lesions located mainly on the spine, pelvis and proximal limbs, leading to the diagnosis of metastatic prostate cancer. M1’s case is the oldest proven case of cancer in ancient Egypt and the second oldest in the world. In 2007, a study published by Schultz et al. in the International Journal of Cancer reported paleopathological evidence of prostate cancer in a Scythian king in Russia. Experts said that the clinical characteristics of this king, who was in his fifth decade of age, bore resemblance to those exhibited by modern-day patients. Similar to M1, cancerous lesions were also identified through microscopic observation. Earlier archaeological findings suggest that ancient Egyptians were not oblivious to the existence of malignant tumors. Early reports of carcinoma were documented in 1500 B.C., when the Edwin Smith Papyrus detailed an initial case of breast cancer in a female. The manuscript spoke of unsuccessful attempts to surgically excise eight tumors through cauterization. The human body replenishes itself through the production of new cells that replace old ones. This is accomplished through cell division – a process by which the body duplicates genetic material. Aberrations in this process lead to cell mutations, which may cause cancer if they occur in a critical part of the gene and persist over time. As a consequence, cancer is more frequently observed in older people. But why are these findings only recently reported when antiquities have been accessible to investigators for many years? The answer is simple: the advent of technology. M1’s cancer was found with the aid of highly sophisticated multi-detector computerized tomography scanners, which make the detection of the smallest tumors quickly possible. The use of these advanced diagnostic tools is not only helpful in uncovering paleopathological evidence, but can provide a wealth of information on attributes such as age of death, lifestyle and even body composition.